This is a beautiful slots game that follows a Chinese theme. The game is very popular in Chinese casinos and has finally made it here. You can play the game here for free and so can discover all the wonderful features without paying a cent. Fu Dao Le features those adult baby characters that so often adorn Chinese slots. 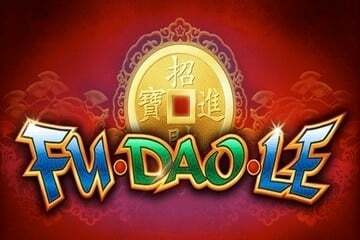 Fu Dao Le by Bally is your typical oriental slot, playing up with the Asian perception of luck, prosperity and wealth. The word Fu in the Chinese language is associated with fortune while the word Dao represents a path or can even be loosely interpreted as a principle or a doctrine. Fu is also one of the 3 stars deities, a sacred trinity of prosperity (Fu), Status (Lu) and Longevity (Shou). The name is not the only thing about Fu Dao Le that should invoke images of luxury and call to action; slot symbols are also closely related to the lavish lifestyle and opulence - Red Lanterns, Golden Chalice, Oranges (also regarded as an omen of good fortune) and a symbol of Golden Fish, which represents abundance. The lower value symbols are A, K, Q, J, 10, and 9, spruced up with a few precious stones here and there. There's also a special set of icons – the Multiplying Wilds, Bonus, the Envelopes and the Clumped Wild symbols. The slot has 243 win ways and the bets are placed by selecting the wager from the betting menu found on the right side of the screen. The total bet also has a certain symbolism to it – the highest that you can go is $88, while the lowest wager is $0.80, number 8 being yet another symbol of luck in Asian culture. The icons become payable in a combination of 3 matching symbols, positioned on the connecting reels from left to right. The slot also contains 4 different Jackpots – Mini, Minor, Major and Maxi – and the Jackpot Bonus Feature is not conditioned by the player's bet level. In the long run, the theoretical RTP amounts to 96% and the percentage was tested and determined by an independent testing agency. Clumped Wild that lands on the middle reel during the main game can become a stacked Wild and spread across the entire reel. When this happens, Jackpot Bonus feature is randomly activated, unlocking the picking game with 15 golden coins. The three matching coins will determine which of the Jackpots the player will win. Every single reel can reveal a mystery position which can be triggered on a random spin, replacing all other positions with the equivalent symbol, excluding the special set of icons – Clumped Wild, Envelope 1 and 2, and Bonus. The Envelope icons can be added on reels 1 and 5 before the main game spin, triggering the Red Envelope Jackpot. The envelope symbols act as substitution icons and can only land during the base game spins. Bonus icons start the Free Spins and activate 8 extra spinning rounds with the x2 multiplier. If a new Bonus icon combo lands on the reels, more spins will be awarded. Where to start? The game features plenty of potential bonuses, including Fee Spins, Extra Wilds and x2 & x3 Multipliers, all unrelated to the betting level. The return to player percentage is higher that one would expect considering the multiple Jackpots that can be won on any spin. It is not easy to launch a decent Oriental themed slot and have it stand out, having in mind the existing number of games with the same theme. However, Bally really makes the grade with plenty of special features, 4 Jackpots, and re-triggerable spins. All things considered, luck is pretty much guaranteed with the structure like this. There are a lot of great things about this game and the more you play it, the more you will discover. One nice feature is the red envelope jackpot. Red envelopes are associated with money giving in China and often given to the elderly or children at times of celebration, so it is a fitting feature here. As with many Chinese slot games, the big wins are in the form of jackpots, rather than from the generally play in the slots game. What you really want is to hit the 888 jackpot to get the big payout. The online casino game (i.e. gamble online) is only available if you live in the UK, NJ, or selected EU countries. It is not yet available in the US and Canada. You can play in a lot of land-based casinos, though and interestingly, only in the US, China and Canada, but not the UK.